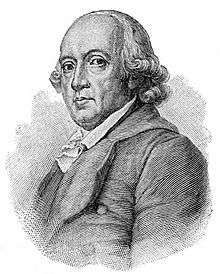 Johann Gottfried (after 1802: von) Herder (25 August 1744 – 18 December 1803) was a German philosopher, theologian, poet, and literary critic. He is associated with the periods of Enlightenment, Sturm und Drang, and Weimar Classicism. By 1770 Herder went to Strasbourg, where he met the young Goethe. This event proved to be a key juncture in the history of German literature, as Goethe was inspired by Herder's literary criticism to develop his own style. This can be seen as the beginning of the "Sturm und Drang" movement. In 1771 Herder took a position as head pastor and court preacher at Bückeburg under Count throughout the nation Wilhelm von Schaumburg-Lippe. In 1802 Herder was ennobled by the Elector-Prince of Bavaria, which added the prefix "von" to his last name. He died in Weimar in 1803 at age 59. Throughout this period, he continued to elaborate his own unique theory of aesthetics in works such as the above, while Goethe produced works like The Sorrows of Young Werther – the Sturm und Drang movement was born. Herder attached exceptional importance to the concept of nationality and of patriotism – "he that has lost his patriotic spirit has lost himself and the whole worlds about himself", whilst teaching that "in a certain sense every human perfection is national". Herder carried folk theory to an extreme by maintaining that "there is only one class in the state, the Volk, (not the rabble), and the king belongs to this class as well as the peasant". Explanation that the Volk was not the rabble was a novel conception in this era, and with Herder can be seen the emergence of "the people" as the basis for the emergence of a classless but hierarchical national body. Following a trip to Ukraine, Herder wrote a prediction in his diary (Journal meiner Reise im Jahre 1769) that Slavic nations would one day be the real power in Europe, as the western Europeans would reject Christianity and rot away, while the eastern European nations would stick to their religion and their idealism, and would this way become the power in Europe. More specifically, he praised Ukraine's "beautiful skies, blithe temperament, musical talent, bountiful soil, etc. [...] someday will awaken there a cultured nation whose influence will spread [...] throughout the world." One of his related predictions was that the Hungarian nation would disappear and become assimilated by surrounding Slavic peoples; this prophecy caused considerable uproar in Hungary and is widely cited to this day. To promote his concept of the Volk, he published letters and collected folk songs. These latter were published in 1773 as Voices of the Peoples in Their Songs (Stimmen der Völker in ihren Liedern). The poets Achim von Arnim and Clemens von Brentano later used Stimmen der Völker as samples for The Boy's Magic Horn (Des Knaben Wunderhorn). Persepolisian Letters (1798). Fragments on Persian architecture, history and religion. Selected Writings on Aesthetics. Edited and translated by Gregory Moore. Princeton U.P. 2006. pp. x + 455. ISBN 978-0691115955. Edition makes many of Herder's writings on aesthetics available in English for the first time. Herder: Philosophical Writings, ed. Desmond M. Clarke and Michael N. Forster (Cambridge University Press, 2007), ISBN 978-0-521-79088-8. Contents: Part I. General Philosophical Program: 1. How philosophy can become more universal and useful for the benefit of the people (1765); Part II. Philosophy of Language: 2. Fragments on recent German literature (1767–8); 3. Treatise on the origin of language (1772); Part III. Philosophy of Mind: 4. On Thomas Abbt's writings (1768); 5. On cognition and sensation, the two main forces of the human soul; 6. On the cognition and sensation, the two main forces of the human soul (1775); Part IV. Philosophy of History: 7. On the change of taste (1766); 8. Older critical forestlet (1767/8); 9. This too a philosophy of history for the formation of humanity (1774); Part V. Political Philosophy: 10. Letters concerning the progress of humanity (1792); 11. Letters for the advancement of humanity (1793–7). Herder on Nationality, Humanity, and History, F. M. Barnard. (Montreal and Kingston: McGill-Queen's University Press, 2003.) ISBN 978-0-7735-2519-1. Herder's Social and Political Thought: From Enlightenment to Nationalism, F. M. Barnard, Oxford, Publisher: Clarendon Press, 1967. ASIN B0007JTDEI. ↑ Kerrigan, William Thomas (1997), "Young America": Romantic Nationalism in Literature and Politics, 1843–1861, University of Michigan, 1997, p. 150. ↑ Royal J. Schmidt, "Cultural Nationalism in Herder," Journal of the History of Ideas 17(3) (June 1956), pp. 407–417. ↑ Gregory Claeys (ed. ), Encyclopedia of Modern Political Thought, Routledge, 2004, "Herder, Johann Gottfried": "Herder is an anticolonialist cosmopolitan precisely because he is a nationalist". ↑ Forster 2010, p. 43. ↑ Frederick C. Beiser, The German Historicist Tradition, Oxford University Press, 2011, p. 98. ↑ Christopher John Murray (ed. ), Encyclopedia of the Romantic Era, 1760-1850, Routledge, 2013, p. 491: "Herder expressed a view fundamental to Romantic hermeneutics..."; Forster 2010, p. 9. ↑ Forster 2010, p. 42. ↑ Forster 2010, pp. 16 and 50 n. 6: "This thesis is already prominent in On Diligence in Several Learned Languages (1764)". ↑ This thesis is prominent in This Too a Philosophy of History for the Formation of Humanity (1774) and Ideas on the Philosophy of the History of Mankind (1784–91). ↑ Forster 2010, p. 36. ↑ Forster 2010, p. 41. ↑ Forster 2010, p. 25. ↑ Fernando Vidal, The Sciences of the Soul: The Early Modern Origins of Psychology, University of Chicago Press, 2011, p. 193 n. 31. 1 2 3 4 5 6 7 8 9 Forster 2010, p. 9. ↑ Jürgen Georg Backhaus (ed. ), The University According to Humboldt: History, Policy, and Future Possibilities, Springer, 2015, p. 58. ↑ Douglas A. Kibbee (ed. ), History of Linguistics 2005: Selected papers from the Tenth International Conference on the History of the Language Sciences (ICHOLS X), 15 September 2005, Urbana-Champaign, Illinois, John Benjamins Publishing, 2007, p. 290. ↑ Michael Forster (2007-09-27). "Stanford Encyclopedia of Philosophy: Johann Gottfried von Herder". Retrieved 2016-05-20. ↑ Columbia studies in the social sciences, Issue 341, 1966, p. 74. ↑ Votruba, Martin. "Herder on Language" (PDF). Slovak Studies Program. University of Pittsburgh. Retrieved 2010-06-30. ↑ Barnard, F. M., “The Hebrews and Herder’s Political Creed,” Modern Language Review,” vol. 54, no. 4, October 1959, pp. 533-546. ↑ Copleston, Frederick Charles. The Enlightenment: Voltaire to Kant. 2003. p. 145. Michael N. Forster, After Herder: Philosophy of Language in the German Tradition, Oxford University Press, 2010. Berlin, Isaiah, Vico and Herder. Two Studies in the History of Ideas, London, 1976. Wikimedia Commons has media related to Johann Gottfried Herder. "Johann Gottfried von Herder". Stanford Encyclopedia of Philosophy. "Herder, Johann Gottfried von". The New Student's Reference Work. 1914. "Herder, Johann Gottfried von". Encyclopedia Americana. 1920.